A summary of the above results focused on the sphere of metabolic consequences of adaptation to different physical activity provides certain prerequisites for deriving some more general conclusions, analyses of further relationships and for attention to some new, ensuing problems. In the first place we should like to emphasize the ontogenetic aspect which leads under contemporary oecological conditions to a very different impact of increased physical activity in different stages of life. 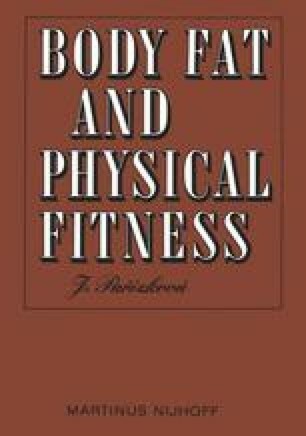 This is suggested by data obtained in experimental animals as well as men.—Increased physical activity results in the relatively greatest differences in body composition but also in other indicators in the period when the trend of spontaneous activity is already declining (i.e. an increase in physical is a relatively great change) but when the adaptive abilities of the organism are still at a high level and when the organism has also a great resistance, i.e. in early adult life (Přibylová 1963a, 1968a). These manifestations, however, obviously depend largely in the entire previous period of life incl. childhood and on the regime of physical activity and adaptation to an increased load in those developmental stages when the organism is formed and is more sensitive to external stimuli which influence immediate as well as late sequelae.